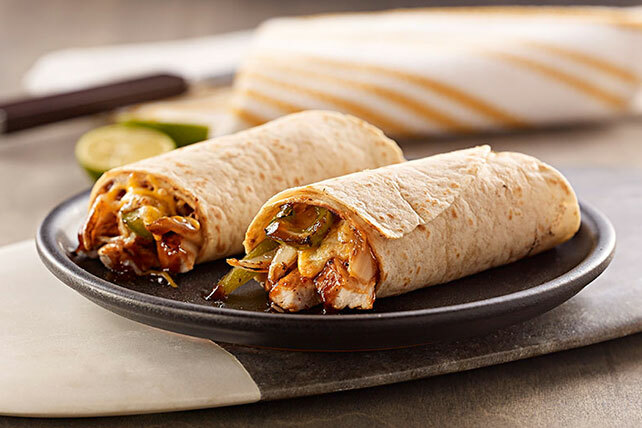 Onions, peppers and chicken breasts are grilled with BBQ sauce and loaded into tortillas with shredded cheese to make these easy summer wraps. Grill chicken 6 to 7 min. on each side and grill vegetables 4 to 5 min. on each side or until chicken is done (165ºF) and vegetables are crisp-tender, brushing frequently with barbecue sauce for the last few minutes. Cut chicken and vegetables into thin strips; place down centers of tortillas. Top with cheese; roll up. Prepare recipe as directed, substituting boneless pork chops for the chicken, and increasing the grilling time to 8 min. on each side or until chops are done (145ºF). Remove chops from grill. Let stand 3 min. before slicing and using as directed. Serve with grilled vegetables! Just brush your favorite seasonal vegetables, such as eggplant, zucchini, yellow squash, asparagus and/or mushrooms, with KRAFT Zesty Italian Dressing. Grill 8 to 10 min. or until tender, turning and brushing occasionally with additional dressing or barbecue sauce. When brushing poultry, meat or fish with sauce during grilling, be sure to discard any unused sauce. Serve the grilled food with fresh sauce to ensure that no bacteria from the raw meat contaminates the cooked meat. To prevent food from sticking to the grill, lightly brush the grill grate with vegetable oil before preheating the grill. Or, spray the cold grill grate with cooking spray.